so cute and very beautiful Dorte. So cute but unfortunately it doesn't appear you used a stencil monoprint? A couple of tutorials on the HLS CAS challenge post if you want to try again--we'd love it if you did! 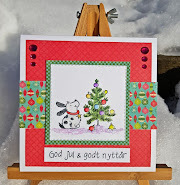 Your lovely stamp goes well together with the stencil, Dorte...so cute! A cute image and card Dorte, the stencil works really well here. I love the way it turned out. And I love that stencil! 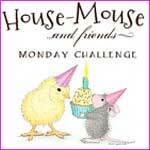 Sweet mouse image looks perfect on the stenciled background you created too. Oh what a fabulous backdrop for this super cute image!! It really looks like he's floating on a serene river...beautifully done Dorte! Enjoy your day! Such pretty colors and lovely background! !